Purchasing the wrong necklace length or receiving a necklace that is too short is a common occurrence. There are a few options that you can consider to extend your necklace. One option allows you to get creative and make something fun. You can match the style of the necklace with a few embellishments or create something simple and chic looking. The options below will save you from having to purchase a longer necklace. Most jewelers and large retail stores offer necklace extenders. You can also find these in some jewelry catalogs. An extender is often a few inches long, but the lengths can vary. Extenders can be found in the same type of metal used to create the necklace so that there is no conflict in color or metal type. Gold, silver and platinum extenders are all available from jewelers. If you are handy with jewelry making tools, you can add length to the chain yourself. This requires taking off one end of the clasp. Once this is complete you can measure a length of chain, in a matching design and metal, to add to the chain. You’ll need to open a link in order to get the new piece of chain to fit in. Once you have opened a link, put in the closed link from the new piece. Use pliers to close the open link back up. Now you are able to reattach the removed clasp part. This will make the necklace look like it was purchased at the new length. Extenders can be made from almost any jewelry making supply. You can use pearls, gemstones and charms to adorn the extension. At craft stores, matching color tone extenders may be available with clasps already on both sides. In this case, you can just add it to the necklace and wear it at your leisure. Consider an extender that is a little longer than you need it so that you can have a short portion of it hanging from the back of the necklace. 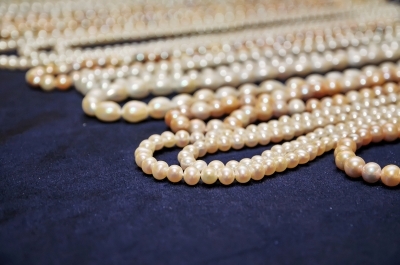 Consider using a few pearls that have been cultured and fitted with a loop on the end to attach it to a necklace. This will give you a touch of elegance while going out with friends. You can do the same with treated gemstones or charms. Making a necklace extender yourself takes only a short amount of time but it is a fun craft project for a rainy day. Once you have mastered the creation of necklace extenders, consider taking a few to a craft show or giving them out as a gift. Sometimes necklaces fit fine but a longer length is desired for a special occasion or look. It is ideal to have a few hand-created extenders on-hand so that you can match several clothing styles or outfit colors. A few different lengths are also ideal to achieve a different look. Extenders are not costly unless you are purchasing fine gold to match the metal used perfectly.